May created this design using the wonderful Dovecraft Pearl Effects. You just need to squeeze a few dots of colour onto your surface and drag the paint down with a thick piece of card or old store card to create some really colourful designs. Pearl Effects are ideal for this project as they are the perfect consistency to create some really effective paint scrape art! Read on to find out how May created this elegant design with our step-by-step tutorial. 1. Take an A4 sheet of white Dovecraft card. 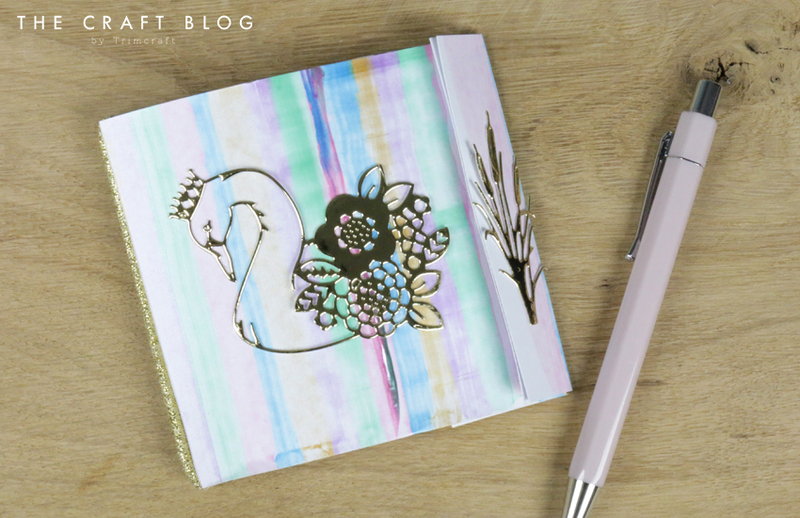 Begin by putting drops of Pearl Effects onto your piece of card, lining up drops along the width of your paper in a pattern. We placed the drops quite close together so that the colour overlaps slightly once it’s scraped down the page. 2. Take your old store card or thick piece of card and drag the drops of Pearl Effects down the page. Here’s it’s good to press down with the card quite firmly so that the colour spreads evenly. 3. Leave your sheet to dry. Tip – you might want to weigh the paper down either side to stop it curling as it dries. 4. Once dry, cut your piece of card to measure 10cm x 27cm using a paper trimmer. Then, score your card at 2cm and at 24cm. Measure 13cm on your piece of card and then place a mark either side of this; making a score line down these two marks. You can just score at 13cm, but you will get a much neater finish if you take care and firmly score so that you have a small panel in the main fold. Fold your card to create the shape of your notebook; the 2cm panel will make a flap in order to fasten the notebook shut. It is also worth making small nicks at the 4 ends of these score lines and fold back and glue in place. This is where the elastic band which holds the paper in place with sit. 6. We kept the inner left side panel plain but cut a sheet from the leftover card measuring 5cm x 10cm and adhered it to make a pocket on the left. It could be used to hold a store card or notelets for example and taking something out of this pocket regularly could wear away the enamel beneath the pocket. 7. Also on the inner left panel, we added a square of gold mirror card measuring 10cm x 10cm. 8. Buff all of the enamelled panels with a soft tissue to polish and strengthen the surface. Add a Velcro dot to the 2cm flap to act as a closure. 9. Cut a number of 9cm x 25cm strips of paper. Fold these in half. 10. Place the papers inside the notebook, securing them with the hair elastic. 11. Die cut the swan and reeds from the First Edition Swan-Themed die set in gold mirror card. Adhere these to the front of the notebook with Dovecraft glue. Your notebook is now finished and ready to write in! We love how easy it is to paint scrape and the finished effect is SO pretty! Have you tried paint scraping before? We’d love to see your creations – don’t forget to #Trimcraft when uploading to social media and to share your projects in the Inspiration area. Such a fun and awesome project here too, and the result looks amazing. Thank you. The notebooks are easy to make.